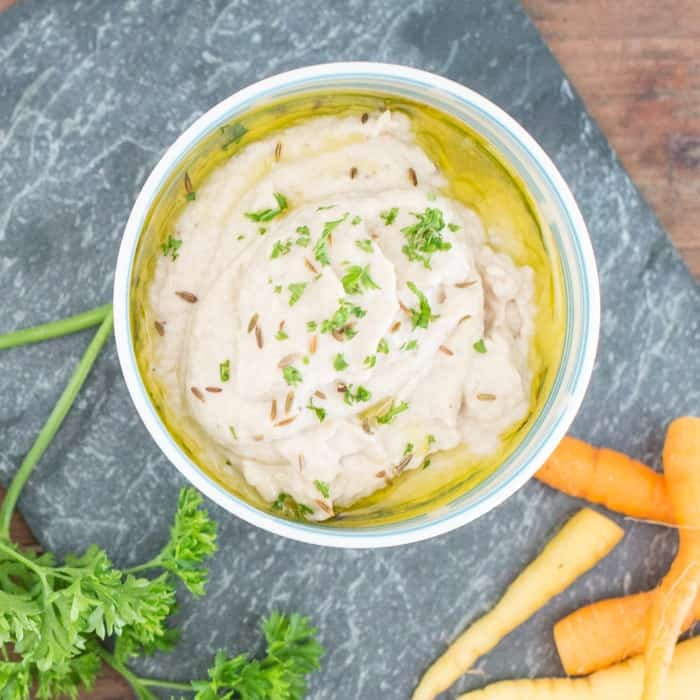 Baba Ganoush is a great little dip to whip up when you need some snack-love to see you through the day. And with aubergines at their very best right now it’s the perfect time to get ganoushing! I remember the very first time I tried Baba Ganoush. It was probably 20 years ago and I fell in love with the name before I even knew what it was! 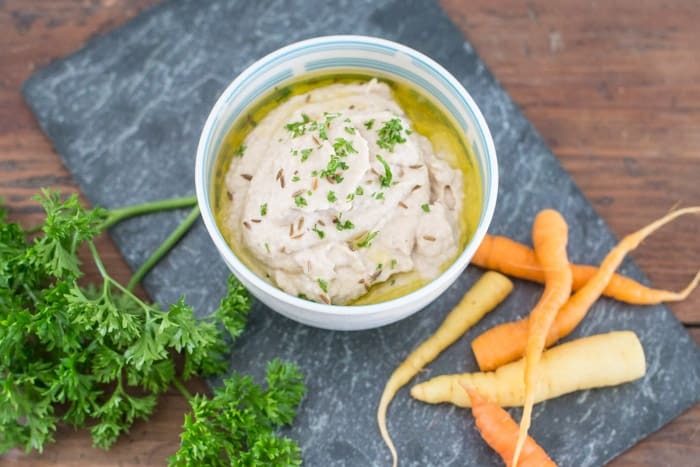 For those that haven’t crossed paths with Baba Ganoush before, it is a silky smooth dip originally from the Middle East. It would normally be served as part of a meze, or spread of little bowls of various, much like the Spanish Tapas. Baba Ganoush is made by charring & removing the skin of an aubergine and then mixing the flesh with garlic, tahini, lemon juice and seasonings. It’s tastes amazing, and is perfect served with some crusty sourdough bread or fresh crudites to dunk in. I grilled my aubergines over the ember of Jonny’s breakfast fire last time he had some mates over camping in the woods. Whilst they lend the Baba Ganoush a lovely smoky flavour, you don’t need to build a campfire in the garden! Add in a little smoked paprika if you want a smoky taste with none of the effort, and cook them under a hot grill. 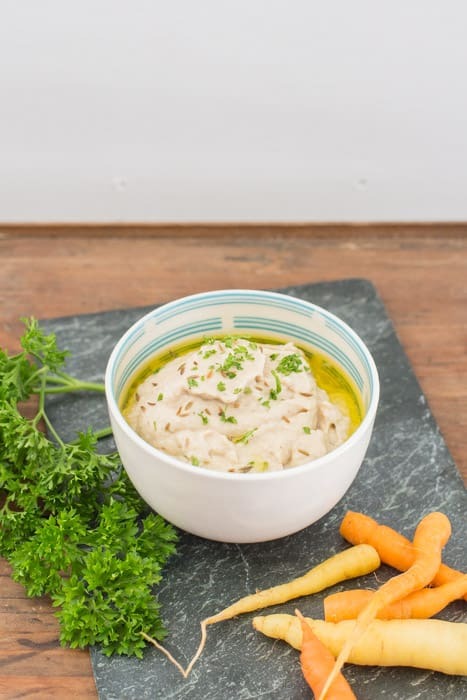 Serve this tasty little dip up with some flatbread or a crusty loaf, on top of a jacket potato, or a fresh vibrant salad and some cured meats if the feeling grabs you. Grill the aubergines over a campfire, BBQ or under a grill until the skin blackens & blisters. Let cool a while and then removed all the bits of skin. Squeeze the flesh between your hands to remove the water from the flesh as this will make your baba ganoush too watery and bitter tasting and mash the remaining flesh with a potato masher or in a blender. Crush the garlic cloves with the salt, and mix together with the aubergine. Do you love baba ganoush? If so, what do you tend to serve it with? And if you need more aubergine inspiration, check out my Griddled Baby Aubergine & Goats Cheese Towers or Bintu’s Roasted Aubergine & Farro Bowl. Aubergine is one of my absolute favorite vegetable so this recipe really rocks my boat. There is a Lebanese place near us that does the BEST baba ganoush. I have tried to recreate it, but it just never tastes as good. Looks fantastic! I’ve never made baba ganoush before, but i think i would be able to make this! I’m actually on my way to the farmers mkt. and will be picking up ingredients for this recipe!